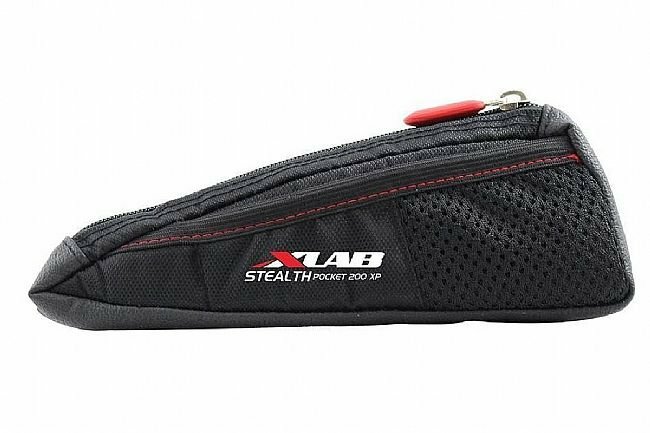 The XLAB Stealth Pocket 200XP storage device provides an aerodynamic pouch with four easily accessible exterior pockets. Providing easy access to all of the race-day essentials, the Stealth Pocket 200XP keeps you stocked up for the duration of the ride or race at hand. The inner storage compartment comfortable fits up to 5 gels, and features an inner structured insert to maintain the Stealth Pocket's aero shape even when fully loaded. The Stealth Pocket 200XP installs quickly and easily stays in place, featuring a rubberized base and durable, non-seizing steel screws for securing to top tube bosses often found in aero road or triathlon frames. Would you drill holes to mount this? Not me. Drill holes on frame? Forget it.